Tara Guy was a guest writer for The Metropolitan. “It’s been a great joy for me to be here. It’s been the heart and soul of my teach­ing,“ said Cre­ative Writ­ing Pro­fes­sor Ali­son McGhee of her career at Met­ro­pol­i­tan State. 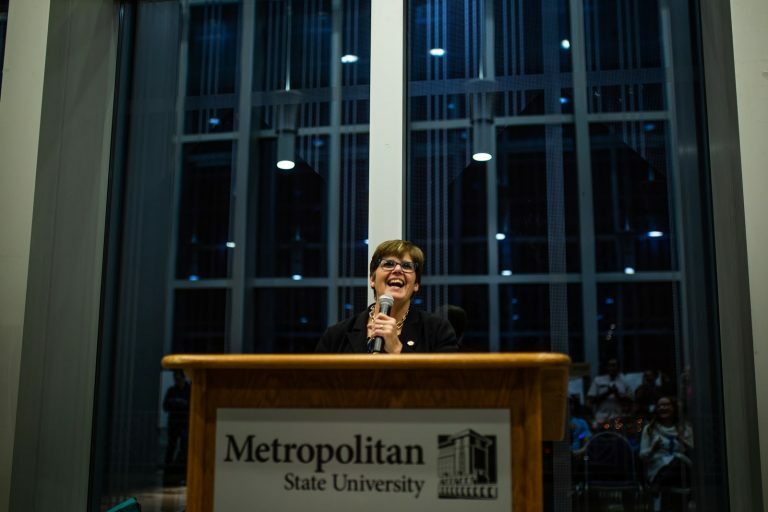 She will retire at the end of the fall semes­ter, cap­ping 28 years of teach­ing and advis­ing Metro State students. Dur­ing those years, McGhee has amassed a loyal and devoted fol­low­ing among her stu­dents. Many remain in touch with her, years after leav­ing her classroom. McGhee released her lat­est children’s novel, “Pablo and Birdy,” at the Red Bal­loon Book­shop in St. Paul on August 23. Her stu­dents, as always, were in the audi­ence. Some from her cur­rent crop of fledg­ling writ­ers, but also sev­eral from her early years of teach­ing, there with their chil­dren in tow. A happy lit­tle reunion ensued, bear­ing out an ele­men­tal truth about McGhee’s years of teach­ing and men­tor­ing. For her stu­dents, McGhee is unforgettable. As the founder of Metro State’s highly respected Cre­ative Writ­ing pro­gram, McGhee has devel­oped the pro­gram into one of the largest depart­ments of the uni­ver­sity. It cur­rently attracts over 100 majors and minors. What hap­pens in the cru­cible of McGhee’s class­room can be very pow­er­ful. Those who have taken her classes have wit­nessed raw emo­tion, and always laugh­ter and tears. Her stu­dents’ self-​exploration through writ­ing often causes per­sonal epipha­nies, and the result­ing rev­e­la­tions can be very intense. 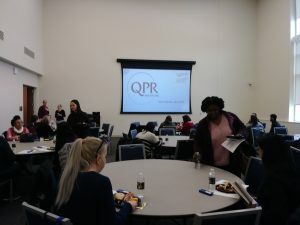 “So often over the years I’ve seen someone’s face look so sur­prised after they read their piece to the class, and they say, ‘I’ve never told any­one that before!’ It’s exhaust­ing — but exhil­a­rat­ing too,” McGhee said. Metro State has been McGhee’s home since she first arrived in 1989 to teach Intro­duc­tion to Chi­nese, her under­grad­u­ate field of study. She was preg­nant and nau­se­ated that first year of teach­ing. “Every time the class took a break, I’d go throw up and then drag myself back to class,” she said. It’s not only her stu­dents that hold McGhee in high regard, but her col­leagues as well. Suzanne Nielsen stud­ied under McGhee after her own return to col­lege in 1995. After a dif­fi­cult period of loss in her life, and feel­ing frag­ile in her new­found recov­ery from addic­tion, she was timid when she entered McGhee’s classroom. “Her abil­ity to encour­age me to grow and find my voice saved my soul. She taught me to hold my head up, and to look oth­ers in the eye. My life is so much richer because of her belief in me,” said Nielsen. There’s also the hard-​to-​ignore fact of McGhee’s extra­or­di­nary com­mer­cial suc­cess. 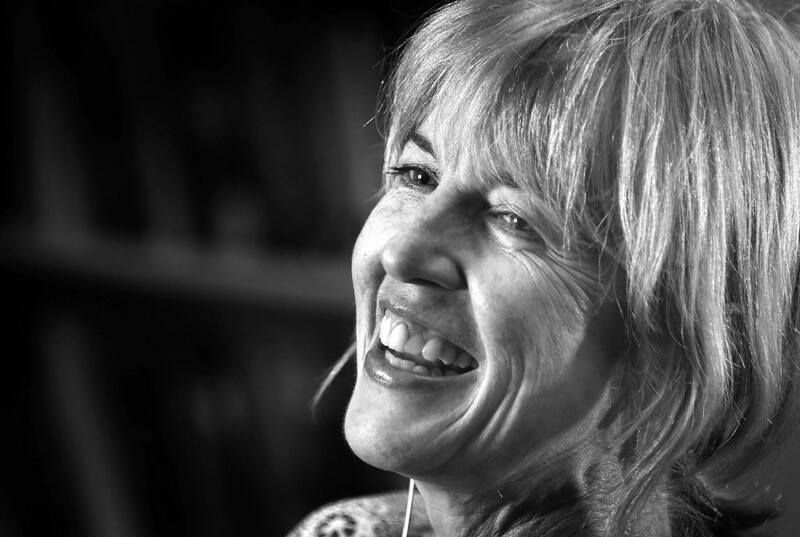 As a New York Times best-​selling author and Pulitzer Prize nom­i­nee, hers is a vast and var­ied bib­li­og­ra­phy of children’s, young adult and adult literature. In addi­tion to “Pablo and Birdy,” McGhee pub­lished a children’s pic­ture book enti­tled “Percy, Dog of Des­tiny” ear­lier this spring. Octo­ber will see the pub­li­ca­tion of a sequel to her Pulitzer Prize-​nominated adult novel “Shadow Baby.” “Never Com­ing Back” marks the return of Clara, a char­ac­ter adored by many of her read­ers, and some­times referred to as McGhee’s alter ego. 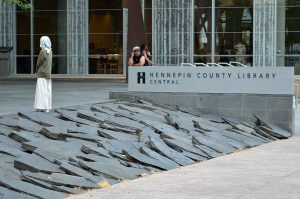 The book launch is Oct. 17 at 7 p.m. at Open Book in Minneapolis. The out­ward trap­pings of com­mer­cial suc­cess might be evi­dent in the lit­er­ary prizes and awards McGhee has received — if she dis­played them on her walls and shelves. But she doesn’t. While thank­ful for suc­cess, she seems indif­fer­ent to the vis­i­ble sym­bols of it. “I for­get about them pretty much right after they are awarded,” she said. It is not the crit­i­cal acclaim or the finan­cial reward that mat­ters most to McGhee. “I’ll tell you what really mat­ters, and that is a let­ter from some­one who loved one of my books, and who says that it made them feel as though they weren’t alone,” she said.